After the fall of Rome in 476 AD, Europe lost both its sources of elephant ivory and even knowledge of the animal that bore it. But the military campaigns by the Latin Catholic Church for the control of the Holy Lands (known as the Crusades) introduced luxury goods from the East, ivory among them. With the conquering of Jerusalem in 1099, merchants began shipping ivory from East Africa along the Red Sea and from trans-Saharan routes to the Mediterranean and on to Venice, Genoa and Marseille. By the middle of the 13th century, a huge carving industry was based in Paris, supplying mostly religious items. The Sainte-Chapelle Virgin (sculpted between1260 – 1270) replicates the natural curve of an elephant’s tusk in its stance. The Virgin leans on one leg while supporting the Christ child on her opposite hip while the baby Jesus reaches out with his left hand to an apple she is holding. Her robe is finely decorated with gold. It was a popular sculpture in the Sainte-Chapelle church, with many imitations. After 1400, ivory began to appear in musical instruments (flutes, lutes, guitars and harpsichords) in scientific instruments (sundials, compasses and rulers) and in weaponry (matchlock inlays of nymphs and hunting scenes). Traders swarmed the Ivory Coast (all of West Africa) the Gold Coast (Ghana) and the Slave Coast (Togo, Benin and western Nigeria). These three main trade items – slaves, ivory and gold – made immense fortunes for the Portuguese, Spanish, Dutch, British and French. 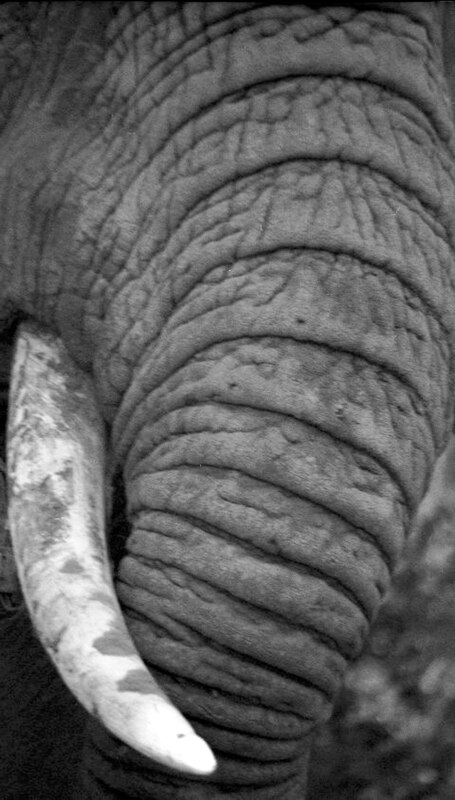 From 1699 to 1725, in a span of only twenty-five years, a quarter million tusks left West Africa, representing the deaths of 117,500 elephants. Each tusk was transported out of the interior on the back of a slave. Invented in 17th century Japan, a button-like fastener called a netsuke secured cords that held small containers on the outside of traditional garments. 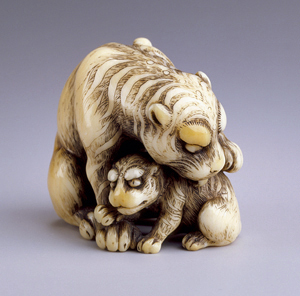 Originally utilitarian in design, netsuke evolved into objects of extraordinary craftsmanship, made of materials that ranged from hardwood to porcelain to ivory, and depicting subjects as diverse as animals to mythological deities. Some netsuke pieces are highly sexual in content and some depict entire scenes from history – all on a miniature object usually no bigger than an inch long. Although traditional netsuke production ended in the late 1800s, modern craftsman produce work that still demands high prices. And, as in ancient times, netsuke continues to be carved from boar tusks, rhinoceros horn, hippopotamus teeth, and elephant tusks. 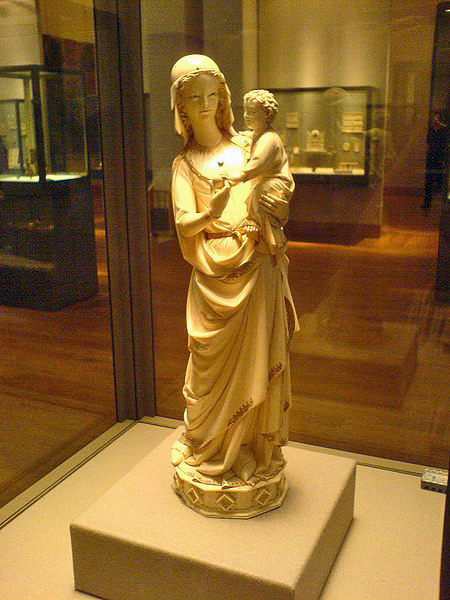 Unfortunately, many reproductions are mass-produced carvings sold with fake staining and cross-hatching that would be found in ancient ivory pieces. Anyone collecting netsuke should have considerable knowledge of the subject before they spend money, even on modern boxwood netsuke. And, as always, modern ivory carvings of any sort, unless they are made from mammoth ivory, probably originate with illegal elephant ivory. From the 1860s to the 1880s, an estimated 100,000 elephants per year were slaughtered for the ivory trade, a total of two million elephants in twenty years, as ivory became the plastic of the Victorian Age. Thank you for the historic information!